It’s been a solid year as far the quality of new-to-me games. I made a considerable effort to avoid being introduced to too many new-to-me games this past year and maybe that has had an effect. This year i didn’t do a top 10 because to be honest i didn’t play that many great games and this has reinforced my belief and intend to play more of the games i already know i enjoy. There are so many of those already. Without further ado here are my top 5 games of 2018. 1. Sidereal Confluence & The Mind: Two very different games but they have both been a breath of fresh air. Sidereal has finally given me a negotiation game i can love while The Mind’s ability to provide entertainment at any time and with any group is remarkable. 3. Gloomhaven: The best dungeon crawler I’ve played. The card scenarios I’ve seen so far look a bit samey (kill all enemies) but i enjoy the card play and appreciate the built-in timer with the exhaustion mechanism. 4. Quartermaster General: 1914 Needing 5 instead of 6 players means it’s easier to get to the table than the original version. I’m also a big fan of the WWI setting which helps. The best team vs team game I’ve played this year. 5. Fog of Love A game that constantly surprised me after each session. Started as a fun role playing game for me and evolved into something very different. A game with more meat and less role playing? Probably. The best new to me 2 player game. –Kakerlakenpoker Royal Much better in practice than on paper. The ShutUp-Sitdown recommendation was spot on. – Azul Easy to teach, great components, has enough depth and is liked by everyone at the table. Very solid abstract. – Menara Only played it a few times at a single gathering. Really liked what i saw though. – Assault on Doomrock Too long and too difficult? Maybe, but i still like it. – Shadowrift I love the Town mechanism. Solid co-op deckbuilder. It’s good to have a sense of direction if not purpose with a hobby and that’s why I’m setting myself some board game goals for 2015. This hobby has given me a lot so far. It has made me more social and as a result I met some wonderful people along the way. It has also forced me to deal with my anger and bitterness issues and although i still have some way to go in order to be at a point I’m happy to be, the difference I’ve seen is a powerful motivator. Ok, ok, this is my list of goals! As i mentioned in my Board Games in 2014 post the most enjoyable games proved to be the ones i replayed the most. So even though i failed in last year’s challenge to play 10 games 10 times the challenge gave me a sense of direction. This is my 2015 list for now. I’ve already played 8 of these games while 2 are completely new to me. Solo plays don’t count. Last year we had 3 major events with the Cyprus Board Gamers group. The 1st Cyprus International Tabletop Day, Cyprus Comic Con and the Saturday of Board Games. All three were fantastic events for us and i’d like us to build on them. Unfortunately this year, International Tabletop Day is on 11 April which is the Saturday before Easter so we will have to do it on a different date. What we will also do is spread out more events over the year. Organising events that include a younger crowd is also on the to-do list. There’s only 1 game i know i’m definitely purchasing as soon as it’s released and that is Nemo’s War. 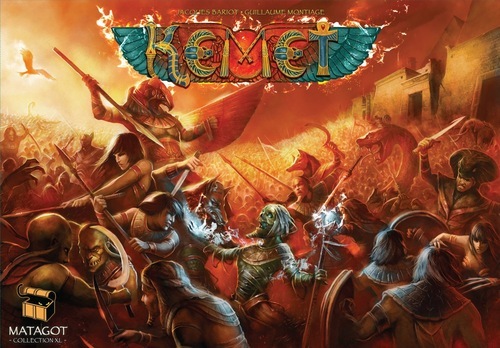 I’m also expecting two kickstarter games (Two Rooms and a Boom and Omen: A Reign of War and Hemloch both of which i backed in 2014) to finally ship this year. Aside from that, my target is to buy just 2 games in 2015. The priority is to play the games i already own and also slim down my collection. Finally, if i’m to invest as much time in this hobby in 2015 as i did in 2014 then i might as well do some good with it. I think that the Cyprus Board Gamers Group has grown and matured enough so that it can run itself, at least more than in previous years. That will free up some time for other board game related ideas. I’m not sure how this will work but it can be sessions at care homes or at community centres for young people. It can also involve fundraising through playing. This is my most challenging goal but also the most rewarding. 2014 was a great year. In terms of how many board games i managed to play, the growth of the Cyprus Board Gamers Group and its activities. Most importantly however, in terms of the new people i got to know and the relationships that developed through the hobby. It’s not just about the games but it’s about the people you play with. On the negative side the hobby took up a lot of my time. Maybe too much time. Also, i bought way too many games and i now have a big stack of games i have either not played yet or want to trade/sell. These are both mistakes i made in my video game days and i’d like to avoid repeating. Looking forward, I have some ideas i want to explore in 2015 of how can i better use the hobby but for now this post is only a retrospective for 2014. There is a very high correlation between how many times i played a game and how much i enjoyed it overall. Most of the best experiences i had were with games i played 5 or more times. This proves what i already knew to be true. Buy fewer games and enjoy the games i already have. For example, Sentinels of the Multiverse only really came into light once i started learning the decks. I logged a total of 393 plays in 2014 compared to 293 in 2013 and 182 in 2012. Partly it’s because in 2014 Game Night! became a weekly thing but it’s also because solo play took off. Robinson Crusoe is now my favourite game to play solo and it’s probably the only one which i prefer to play solo rather than cooperatively. But it wasn’t just RC. 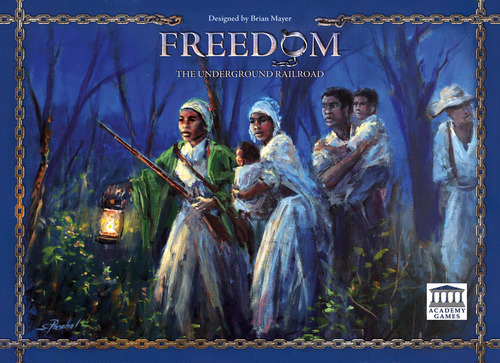 I also loved my solo plays with Eldritch Horror, Sentinels of the Multiverse and Freedom: The Underground Railroad. Finally i have to give special praise to Archipelago and Twilight Struggle. The former has become one of my all time favourite multiplayer games, giving Dominant Species a run for its money. But it was also a good year for Twilight Struggle which i managed to play 5 times. What a fantastic game this is when you have the time for it. I played 41 games just 1 time while 28 games were played 5 or more times. These are currently the games I’ve yet to play in the order of preference how much i want to play them. 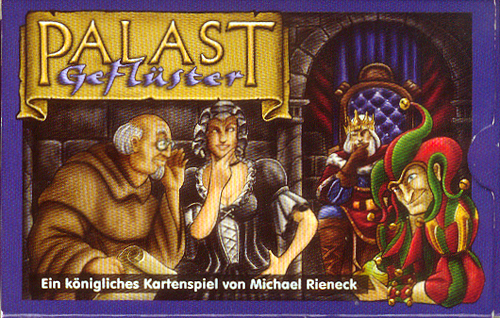 Of course some are a lot easier to introduce than others so it’s likelier that i will first play No.10 Palast than say Risk: Legacy or CO2. The plan is to reduce these unplayed games down to 10 or so by the end of the year. As mentioned several times already, in 2014 I went through a crazy buying spree of board games. Although the number of my plays has also increased i still can’t keep up. I had been meaning to have some wall shelves installed for some time now and the recent spree only made it more urgent. 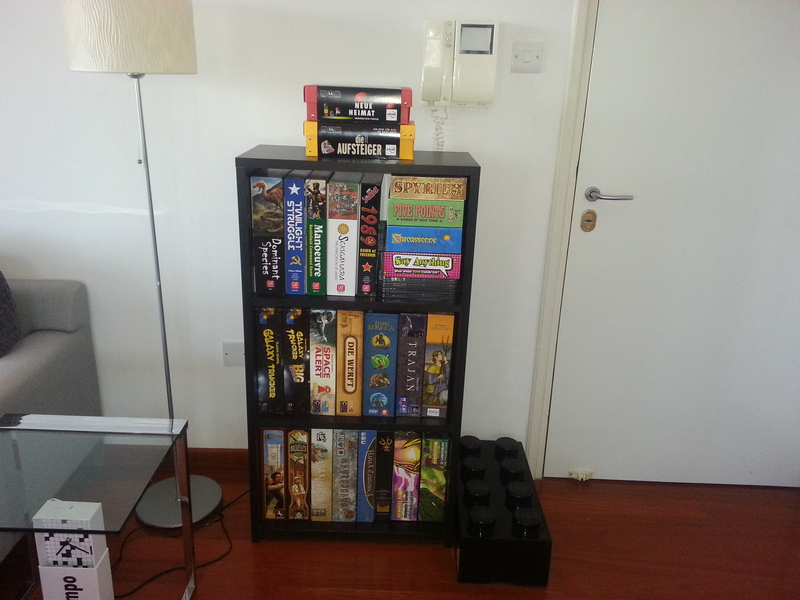 This is now currently my main setup for board games storage. The plan was to get rid of the small bookcase but it does not look like it’s happening soon as I don’t want to over load the wall shelves. 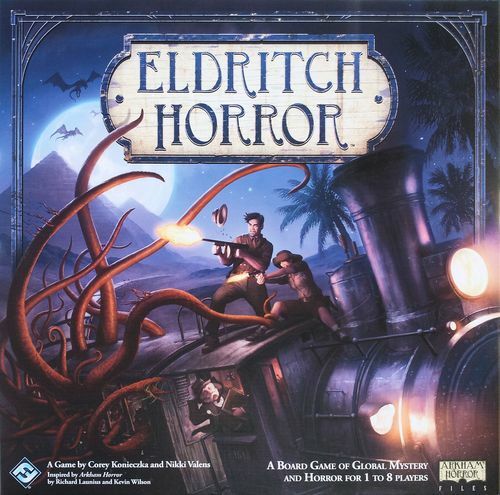 My most recent purchase is the expansion to Eldritch Horror, which i have already played 6 times (5 base game plus 1 with the expansion) so i consider that as a “sensible” purchase. 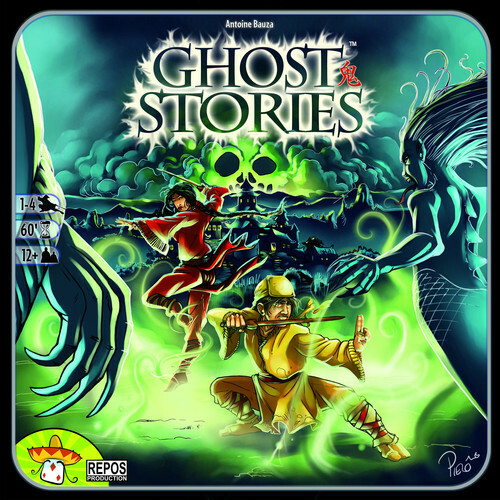 Also i’m still waiting for delivery of 4 Kickstarter games later this year (below). Coup Reformation, Septikon: Uranium Wars, Two Rooms and a Boom, Steam Donkey. I definitely need to put a stop to more acquisitions possibly for at least the remaining of the year. However, If i say that i won’t buy anything i don’t think it will be realistic. Nemo’s War (2nd Edition) is a game i already have in mind but i think it’s not coming out in 2014 anyway. So i’d say i can buy just 1 more game this year and i will also try and clear out a few games. At this point in time i have around 20 or so games I haven’t played. I’d like to play at least half of the un-played games i already own. These are the games which either i have already made up mind i want to get rid of or i’m thinking about it. I had sold this to a friend a year ago but he returned it to me to give it away as he was not going to play it after all. Unless anyone else wants to keep it i think i will donate it to the Workshop where we hold our Cyprus Board gamers meetings. I got 2 copies of this game in the last EU Maths Trade so i need to get rid of one. I bought this last year, opened it but never played it. I should never have bought it in the first place since it’s not a game i want to try or play. A cute little game but i got bored with it. This is a good game but i rarely have fun playing it. It’s very strange because it ticks almost all the boxes for what i consider to be a good game. Good decisions, interactive and plays within a reasonable amount of time. However, apart from the fact that i don’t like as much as i would like almost everyone else in my group owns a copy so i can afford not to have it in my collection. I have only played this once and I want to play this more and decide. I don’t have any other game similar to this but it seems to be a a difficult game to get to the table. This is a game that has already seen a lot of plays considering how recently i bought it. It’s very easy to teach, quick to play and has wonderful components. Yet, it has not clicked with me for some reason. Maybe it’s the engine building aspect which is one of my least favourite aspects in games. Also a friend of mine owns a copy so once again, it’s not a game i feel i need to have in the collection. The World Cup has taken over most of my free time. Watching it and also discussing it. I’m running a World Cup tournament and with (almost) daily updates it’s been a good change. Not complaining. Especially when the football is good. 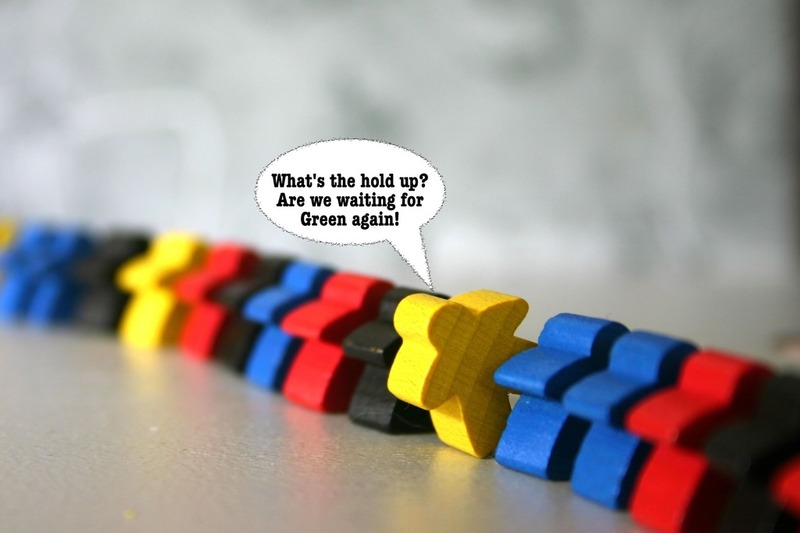 What this means is that board games have taken a back seat for the time being. But the first half of 2014 has been a great year. My weekly core group has been meeting regularly and we have added another enthousiastic gamer to our group. The Cyprus Board Gamers have also been doing fantastic. The meetings are now a weekly thing and they’ve been regular for the most part. We also organised a Table Top Day event to celebrate the hobby of board games which turned out to be a great success. One of my highlights of the year. Brilliant! Last but definitely not least i’ve started playing with my family. Specifically, my sister and her daughters (6+ and 3+) and it’s been great. We’ve played Flash Point, Zooloretto and Forbidden Desert. To actively do something together where we are all participating. Doing stuff with my family has been a challenge for me and i hope board games will help. Maybe future posts will cover this. What’s been bad in 2014? From December 2013 and until May of this year i went on a buying frenzy. Board game after board game. Unfortunately i have a consumption addiction. I had it with books, video games, comics and now board games. It’s not about the game, it’s about the excitement of the buy. Something i’ve been trying to work on with mixed results. For example i’m very good with my books now as i’m almost at the point where i only buy a book at the time i’m going to read it. My collection of unread books has fallen dramatically. Board games have been a disaster. Especially since there is only so much time available to play them. My time and other people’s time is limited and it does not always coincide. I expect that at least around 20 or so games i currently own will be traded or sold away. And i’m not just talking of the games i have already played….. Like i said it was not about the games but about the buying. What about the games? I’m only going to mention the games that are at the top of my list. 1. 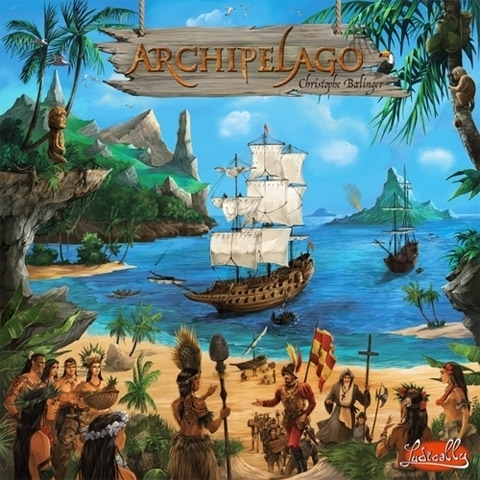 Archipelago – definitely the highlight of the year and a strong candidate for my favourite game of all time. It has everything i love in board games. Theme. Player interaction. Manageable uncertainty. An uncertainty which keeps everyone engaged until the end because you don’t know for sure who is winning. It tells a story. A story which the players create and not scenario based. 2. 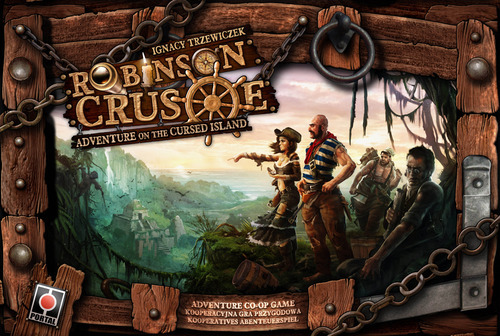 Robinson Crusoe – I hate the rulebook. I hate the FAQs. I hate the vagueness of the cards. But i love this game. Oh, I love it. By far and away the best solitaire game i’ve played so far. Chopping wood, making a pot or building a roof in order to protect yourself from the weather. These are menial tasks that have me at the edge of my seat. A game that leaves me (together with Archipelago but for different reasons) emotionally exhausted. I never thought feeling so alone and helpless while playing a board game would be so good. 3. 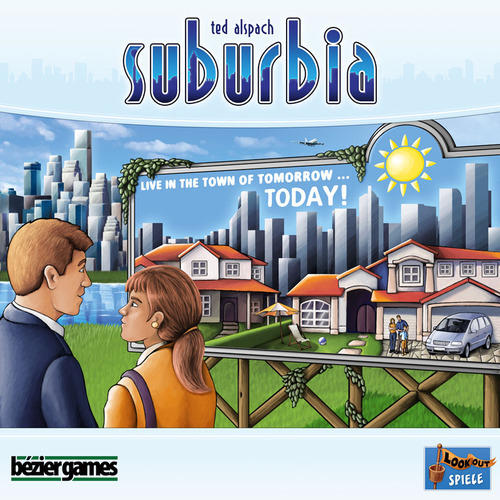 Suburbia – Possibly my favourite engine building game. In general i dislike engine building games but this has proved to be the exception. Easy to teach. Accessible and clear rules. Plays fast and enjoyable to the end. I’m finding it difficult to come up with a game i loved and have played < 10 times this year. This is something i noticed when i was doing my ratings adjustments on BGG (another post to cover this). Sure, there are games that i’ve quite enjoyed playing such as Firenze and Spyrium but they are not at that level for me yet. Maybe with more plays this can change. 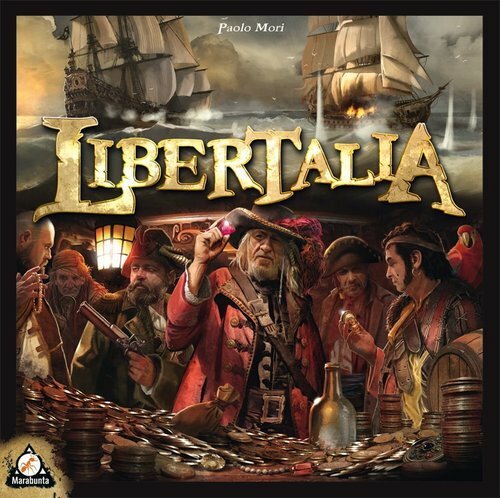 I think if i had to choose one it would have to be Libertalia, a game i only managed to play once during the Table Top Day event. It’s a game that has stayed with me ever since that one time. Ironically, it was a game which i thought i would dislike after reading and watching reviews. It was a reminder to me that i should be more open minded and give games a chance or two before making my mind up. 2014 has been great. My plans for the remaining of the year? Play more and have more fun with fewer purchases. This is a tactical combat game which takes around 30 minutes and that’s only if you manage to survive that long. Usually it’s earlier because you have experienced defeat the Zulus. 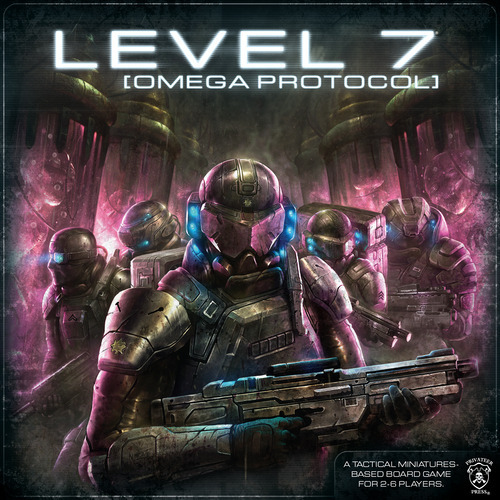 This game is part of the so-called State of Siege series where you are defending a central space on the board against the enemy. In this case you take the role of the British Royal Engineers defending the station of Rorke’s Drift on 22-23 January 1879 against the Zulu army. Just over 150 British and colonial troops successfully defended the garrison against an intense assault by 3,000 to 4,000 Zulus warriors. 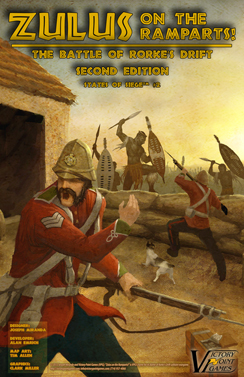 The Zulu attacks on Rorke’s Drift came very close to defeating the garrison but were ultimately repelled. Eleven Victoria Crosses were awarded to the defenders, along with a number of other decorations and honours. Every turn, the first thing you do is to randomly draw a chit. This can either move the Zulu iButhos (units) or trigger certain events. Then, using cards you have in your hand you can perform a single action (e.g built barricades, extinguish a fire, provide ammo, make heroes available). After your action, play continues with you drawing a single card at the end of the turn from a deck of cards. Among these cards are volley cards used to fire at the Zulu units and also Hero cards. These are individuals who provide you with abilities to do more during your turn e.g perform an extra action for free or draw an additional card. The board of Zulus on the Ramparts. There are 4 Zulu regiment tracks all converging to the centre of the board where the garrison is located. There are moments in the game where there’s a lot of tension with the Zulus advancing towards your position and you have interesting and difficult decisions to make. Should you sacrifice a Hero to force the armies into retreat thus giving you precious time to set up more barricades or to form a Reserve Platoon? Should i fire my volley card now or wait until they come closer and it can be more effective? At the end of the day this is a simple game but it keeps you engrossed in what you are doing and that’s the key for me even though this particular battle and subject (theme) was of no real interest to me. 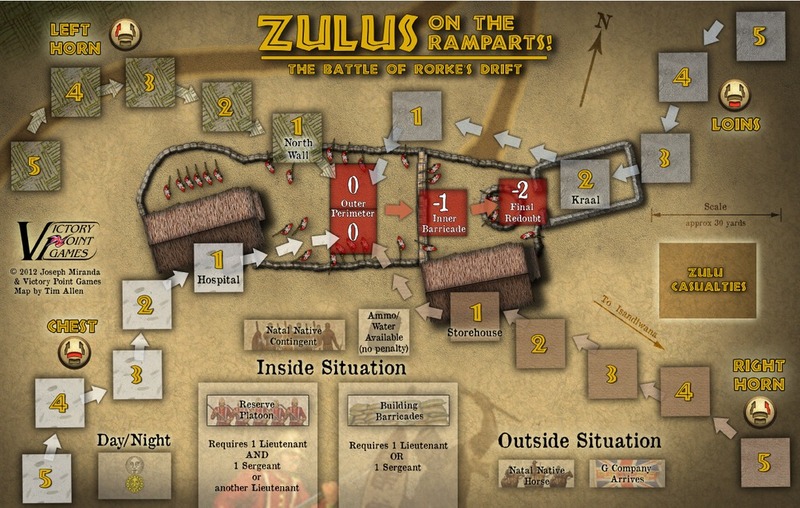 I have now played Zulus on the Ramparts 11+ and i’m still enjoying it. It’s a short game which you can easily reset to give it another go once you’ve played it. I think Zulus on the Ramparts is suitable for someone interested in experimenting with solitaire games.